Set up Conduit mLinux and mDot for use with LoRa. Refer to Conduit mLinux: Getting Started with LoRa. If UDP doesn’t work, confirm udp["appPortUp"] is 1784 by looking at the config that’s printed in /var/log/lora-network-server.conf when the server starts. To transmit one packet back to the mDot, the Conduit must receive one packet from the mDot. 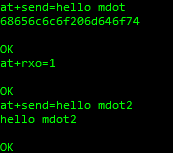 Because Conduit and mDots are currently designed for the LoRa Class A specification, the Conduit can only send a packet to an mDot during one of the two receive windows the mDot opens after transmitting a packet to the Conduit. var topic = "lora/" + eui + "/down"
Download a sample Node.js app that demonstrates how to receive and send LoRa packets.